After eight months of traveling together, Dave and I have fallen into our simple routines. We know what each other likes to eat for breakfast, we know how long we can each go without eating during the day and we agree on walking almost everywhere rather than taking other modes of transportation. None of this is really new for us, it is how we have traveled for years. We had family meet us in London for a few days before we headed off to Norway. It was my third time in the city, but Dave's first. Our nieces, ages nine and 12 joined us, and it was a joy to see travel through their eyes instead of ours. It also shook up our travel routine and we really played tourists again. It was also our nieces' first time in London and the four adults did our best to drag them all over the city, on tube ride after tube ride and to sight after sight. I am pretty sure Dave and I were more worn out at the end of the day than they were. We made a list of our London highlights on our last night together and it covered a full page. It was a whirlwind few days. The top of the London Eye. Anna and Sloane with a Beefeater at the Tower of London. On a double decker bus tour in front of Big Ben. 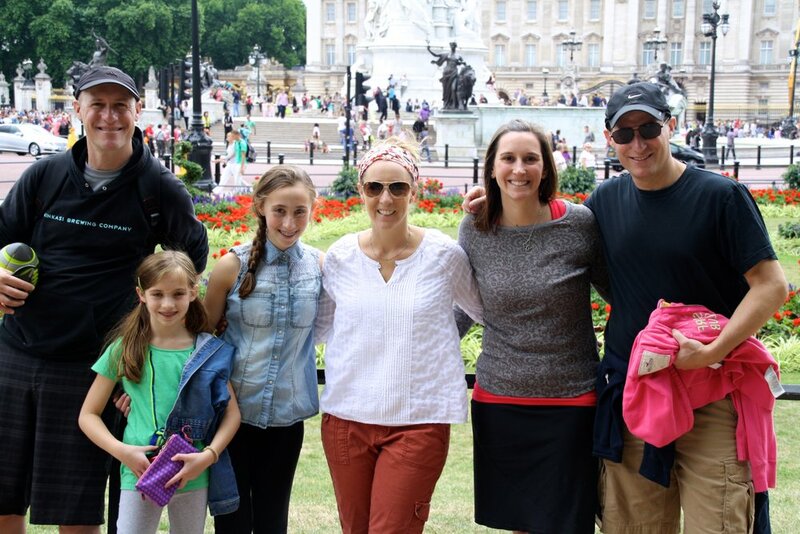 The whole family outside Buckingham Palace. One late afternoon, the ladies on our trip headed to the Chesterfield Mayfair hotel for a take on an English tea. To our great surprise, it was a tea inspired by Charlie and the Chocolate Factory. A fizzy drink started our tea, followed by traditional scones and sandwiches along with a golden egg, a Wonka bar and an Oompa Loompa cupcake. We had an afternoon full of laughter and silly girl talk (potentially fueled by the sugar overdose). It was one of the highlights of my time in London. Tea at the Chesterfield Mayfair. Our few days with our family was more than we could have hoped for and getting Dave to London was a small side benefit. It's taken me a few years to visit London for the first time in my life. To tell you the truth I don't really think of London when I think of Europe -- it doesn't seem like a foreign country to me. The language is obviously the same (for the most part), I typically don't like big cities and have little interest in the Royal Family. I don't have anything against London per se, I've just felt if I was going to spend valuable vacation time in Europe I would rather be elsewhere. After a whopping three days there I feel confident enough to make some generalizations about what London is all about. Any issues I had with London were mostly my own and nothing against the city. I'm not the type of person to spend much time in museums and London is littered with them. The historical buildings are impressive, but only hold my attention for a short while. It was great to finally see Big Ben, London Bridge and Buckingham Palace (we missed the changing of the guard) in person, but I felt like I had seen them already. We came at one of the busier times in the summer, which meant huge crowds at the tourist destinations and entry prices were exorbitant and I felt bordered on gouging ($30 to go into the Tower of London). That's the London that many tourists see, at least on a first visit. Hanging out with my nieces, brother and sister-in-law made it all worthwhile and being a tourist was fine for a couple of days. Besides the time I got to spend with my nieces some other highlights were going to a few traditional English pubs, particularly hanging out outside as the locals do, and visiting a number of London's beautiful parks. We also spent time in the Islington area outside of central London and found the area to be filled with interesting restaurants, a couple of great outdoor markets and even some good craft brew and barbecue at Duke's Brew and Que. A big beef rib at Drew's Brew & Que. We're spending a few more days in London after our cruise and I'm confident we'll find some interesting things to do. I'm even excited to see Churchill's war rooms.